Mood lighting, rustic swings, rockers–these are just a few things that many homeowners are adding to their patios to create an enjoyable open-air, outdoor living room. However, using these outdoor living rooms for cookouts and other recreational events is sadly limited by cold weather. to bring the ambience and warmth of their livings rooms outside. 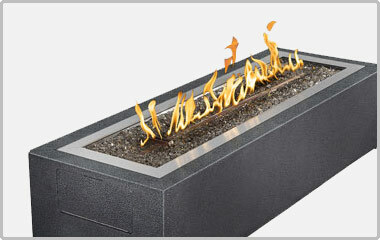 If you're interested in a gas fireplace, a fire pit or a gas patio heater, Contact us online or call 1-800-888-1045. Main purpose: Adding style and ambience to the outdoors. Secondary purpose: Bringing warmth to the outdoors. Outdoor gas fireplaces, fire pits and fire tables give you a stylish design anchor for you to center your outdoor furniture and other outdoor living elements. They also add an enjoyable simple campfire atmosphere, full of storytelling and laughter with those you love, to your outdoor gatherings. If you're interested in a gas fireplace or a fire pit, contact us online or call 1-800-888-1045. Main purpose: Providing an inexpensive and portable way to bring warmth to the outdoors. Never again let the partying or family get-togethers end just because it gets colder outside. Gas patio heaters provide radiant warmth to extend outdoor activities when the season is cooler. For larger outdoor parties: Get a commercial series patio heater that provides a 25-foot diameter of radiant heat. For smaller, personal get-togethers: Get a tabletop series patio heaters that provides a 7-foot diameter of radiant heat. If you're interested in a gas patio heater Contact us online or call 1-800-888-1045. We're the Puget Sound-area outdoor heating experts.